Knobby and fatty, with protruding discs of marrow, oxtails turn off a good many home cooks before they even get a second look. But step right up, your new favorite fall braised dish is here. First get past the name. It’s cow. And the tail? There’s beautiful meat lurking here, like short ribs but even silkier and more tender when braised. I used oxtails for years in soup, with long stewing vegetable and plump barley. Your average stew meat cannot compete with oxtails for flavor and body for a cold weather vegetable soup. But this recipe was a revelation. The method below produces one of the most delicious dishes to enter my life in years, and it’s shockingly simple. Other recipes may have you braise in red wine and beef stock, with finely chopped mirepoix and a bouquet garni. This one? Season liberally, add two bay leaves, splash with Worcestershire sauce, and throw it in the oven. Let the oxtail, its beautiful collagen, and heat work its magic. 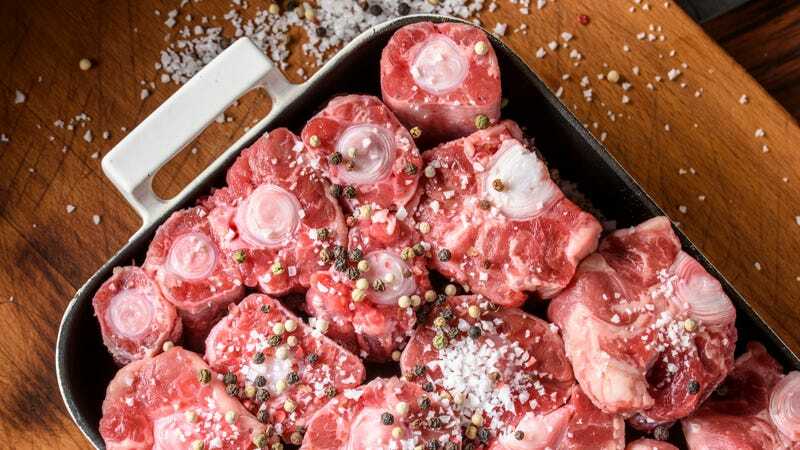 Oxtail is not hard to find—start looking for it at your regular supermarket. I have also found large packs of it at Mexican grocers. Whole Foods carries it frozen, which is great if you remember to buy it three days before you plan to cook it. So shake up your autumnal beef stew routine and skip those pricey short ribs. Oxtails will run you about $8-10 a pound. True, there is not a ton of meat, but what’s there is so rich and luxurious you’d be satisfied with its modest quantities. It’s divine over mashed potatoes, egg noodles, rice, polenta. Heat oven to 350 degrees Fahrenheit. Put oxtails in a shallow baking dish (ideally a shallow round casserole, but a 13-by-9-inch baking dish is fine too). It’s okay if the meat is clustered together, it won’t affect the cooking. Shake over several large splashes of Worcestershire or soy sauce. Sprinkle liberally with kosher salt and fresh-ground black pepper. Scatter the bay leaves on top and pour in water to come up to a scant 1/4 way up the meat. Cover the dish tightly with foil—tent it slightly so the foil is not touching the meat. Bake in the oven for at least two hours and check the meat. Fork tender is not good enough for oxtail. Press the meat with your finger—if it’s bouncy it’s not done. After three hours, the meat should be darkly bronzed and yielding, even sticky to the touch, which is a good sign that the collagen has melted. Very large oxtails piece may take up to four hours, but I would encourage you to remove the little pieces after three hours. Save that leftover fat if you don’t slurp it all up. You can toss it with potatoes before frying or roasting. Or carrots and parsnips. Or drizzle it on your oatmeal in the morning. Everyone loves beef fat.